Yes, it is that time again – not just Super Bowl time, but GIRL SCOUT COOKIE TIME!!! How can you resist those beautiful colored boxes filled with deliciousness, and sold by girls who are learning to be leaders. Last year I decided to skip the Girl Scout Cookie Recipe Contest, I was just too busy, and I couldn’t fit it in. This year I am even busier, but when I saw the email that they were going to be celebrating the 40th Birthday of the Samoas Cookie, I just had to make time. That combination of chocolate, caramel, coconut and shortbread is a winner…and just happens to be my favorite cookie. The Girl Scouts are an amazing organization. Their mission is building girls of courage, confidence, and character, who make the world a better place, by helping them discover their inner strength, passions, and talents. Working at a company that is predominantly male has really taught me how important it is for women to be heard – and without that confidence and courage, it can be difficult. Fortunately this organization is teaching girls at a young age how important it is, so when they grow up and are in the workplace, they won’t even have to think about it. They will hold their head high, proud of what they are able to accomplish. As in the past, if I win the grand prize, I would like to donate the money to a charity – and I am going to ask you – my readers – to choose the charity. That’s right – so stayed tuned for more on that – no sense in giving more details if I am not a finalist. This competition is stiff – I know from experience – so let’s hope that I can at least make it as a finalist this year. So why did I choose this pie? Well, I had a lot of different ideas, but ice-cream just kept coming back to me. I think it’s because I have secretly always wanted to make Samoas ice-cream. And oh boy is it amazing. Although the crust on this pie really was the kicker – once I took those cookies and put them into the food processor – I knew they would make an unbelievable crust – and I was right. So not only do you have a cookie bottom, you have cookies in the ice-cream as well, and then with some of my grandmother’s chocolate sauce, and a caramel sauce that was easy as pie to make – you have an ice-cream pie that is absolutely over the top. If you don’t have an ice-cream maker, you can definitely just buy some vanilla ice-cream, and fold in the coarsely chopped cookies, before adding it to the pie. Darigold was nice enough to put in some coupons with the cookies, so I decided to go home-made. YUM. If after reading this post, you are ready to go get yourself some cookies – don’t fret – you can find the cookies here! Unfortunately you will have to wait a little bit, as the cookie sales happen from February 27 – March 15 – but it will be here before you know it. Happy Birthday Samoas!! Make the crust. Pre-heat the oven to 350 degrees. Put the Samoas into the food processor and pulse until the cookies are finely ground. Add to a bowl. Melt the butter and pour over the cookie crumbs. Mix well, so that the butter is evenly distributed. Press the cookie mixture into a 9″ pie pan, and press up the sides of the pan evenly. Bake for 8 minutes, and then cool completely. Make the ice-cream. Whisk the eggs in a mixing bowl until light and fluffy, 1 to 2 minutes. Whisk in the sugar, a little at a time, then continue whisking until completely blended, about 1 minute more. Pour in the cream, milk, and vanilla and whisk to blend. Transfer the mixture to an ice cream maker and freeze following the manufacturer’s instructions. When the ice-cream is done, add the coarsely chopped Samoas and fold into the ice-cream. Put into the freezer for at least 1 hour. Make the fudge sauce. Melt butter over medium heat. Add unsweetened chocolate & melt, stirring. Add cocoa, sugar, and milk and stir well to combine. Boil a few minutes, stirring. Turn off the heat then add vanilla and salt. Stir to combine. Heat GENTLY in microwave to soften & serve. Make the caramel sauce. Mix all ingredients in a medium saucepan over medium-low to medium heat. Cook while whisking gently for 5 to 7 minutes, until thicker. Turn off heat. If sauce is thin, just continue cooking for a few more minutes. Put the pie together. Add the ice-cream to the pie pan with the cooled crust – spreading evenly on top. Soften the fudge sauce and caramel in the microwave, and drizzle on top of the pie. Put back in the freezer until you are ready to serve. Let the pie sit on the counter for about 10 minutes before serving so it is easier to cut. 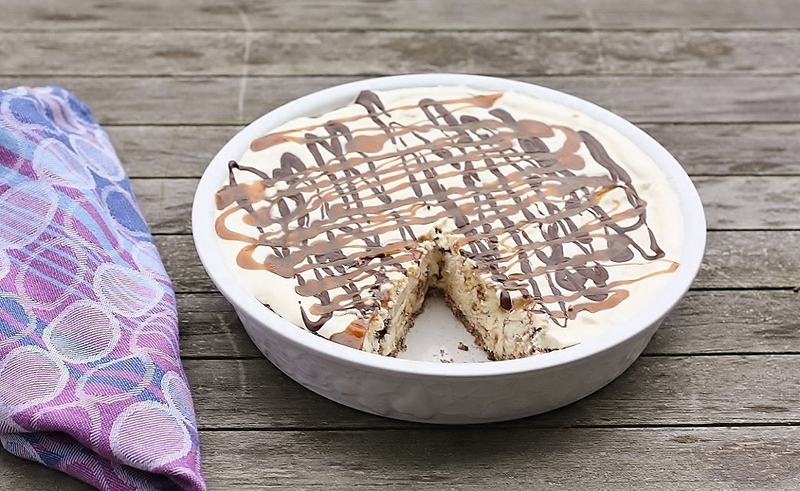 Wow this is one incredible looking ice cream pie! This looks delicious and I love your photos! 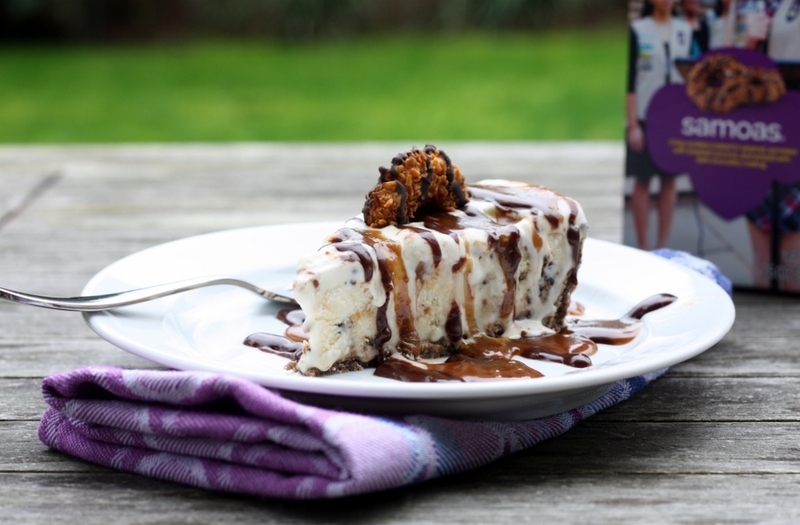 Pingback: Girl Scout Cookie Dessert Round Up! 30+ Recipes!